ENGEO Incorporated has been named one of the 25 Best Small & Medium Companies to Work for in America. The list was announced on June 25th before an audience of more than 20,000 at the Society for Human Resource Management’s (SHRM) 59th Annual Conference & Exposition in Las Vegas. Stories about the winning organizations will appear in the July issue of HR Magazine, the Society’s flagship publication with a circulation of 210,000 (available at www.shrm.org/hrmagazine). The winning organizations will also be listed on the GPTW web site at www.greatplacetowork.com. 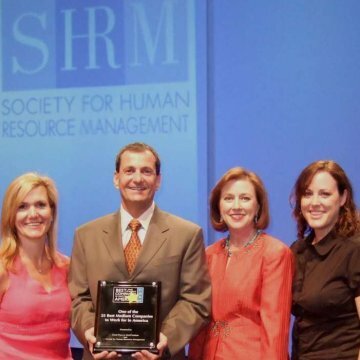 SHRM is the world’s largest association devoted to human resource management. Representing more than 210,000 individual members, the Society’s mission is to serve human resource management professionals and to advance the profession. Founded in 1948, SHRM currently has more than 550 affiliated chapters and members in more than 100 countries. Great Place to Work® Institute, Inc. is an international research and consulting firm dedicated to building great workplaces. Great Place to Work® Institute uses its employee survey and assessment process to select the companies appearing on the annual “Best Small & Medium Companies to Work For in America” list and FORTUNE’s 100 Best Companies to Work For® list. In addition to its global headquarters in San Francisco, Great Place to Work® Institute has 29 affiliates in countries throughout North America, South America, Europe and Asia. www.greatplacetowork.com.